Regionis Biturigum Exactiss: Descriptio per D. Ioannem Calamaeum. Limaniae Topographia Gabriele Symeoneo Auct. These are two rare 1579 regional Abraham Ortelius maps on a single folio sheet. The Left Map, centered on Bourges, depicts the Loire Valley region from Gian to St. Sebastian in the south and from Le Blanc east as far as Nevers. Several important cities are noted, including Argenton, Neuers (Nevers), Bourges, Le Blang en Berry, Romarantin, Vierzon, Chasteau Neuf, and others. The right map follows the flow of the Alliers River from Randan to Gondole. Important cities, including Beauregard, Cleremont, among several others are noted. Each map features a decorative cartouche and details their respective regions in wonderful detail with attention to forests, cities, rivers and villages. 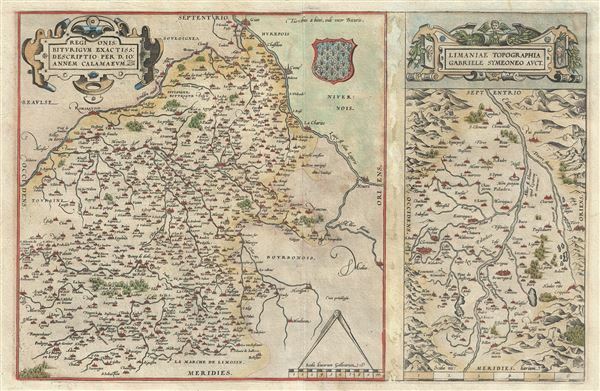 This map was issued in 1579 by A. Ortelius for issue in his seminal atlas Theatrum Orbis terrarium. Very good. Two maps of single sheet. Original Centerfold. Latin text on verso. Some dampstains over center margin. Van den Broecke, Marcel P.R., Ortelius Atlas Maps: An Illustrated Guide, 45. Koeman, Cornelis,Atlantes Neerlandici. Bibliography of Terrestrial, Maritime and Celestial Atlases and Pilot Books, Published in the Netherlands up to 1880, vol III, Ortelius 21.